If you have ever lived north of the 42nd parallel, chances are you’ve heard of Seasonal Affective Disorder. S.A.D. isn’t just a fancy term for the winter blues; it’s a documented medical condition that afflicts certain people in the late fall and winter, with symptoms that include depression, a lack of energy, insomnia and feelings of hopelessness. While the exact causes remain unknown, sunlight plays a key role, probably by affecting serotonin, melatonin, vitamin D levels or some combination thereof. Percent of possible sunshine. What percentage of the time is it sunny in the months of November, December, January and February? This is the average percent of daylight hours in which the location receives sunlight. Gloomy winters in the northwest. The Pacific Northwest lives up to its rainy reputation, claiming all four of the top spots for the darkest winters. The PNW has the perfect combination of short days and frequent cloud cover to usher in darkness during the winter months. Lake effect takes a toll. 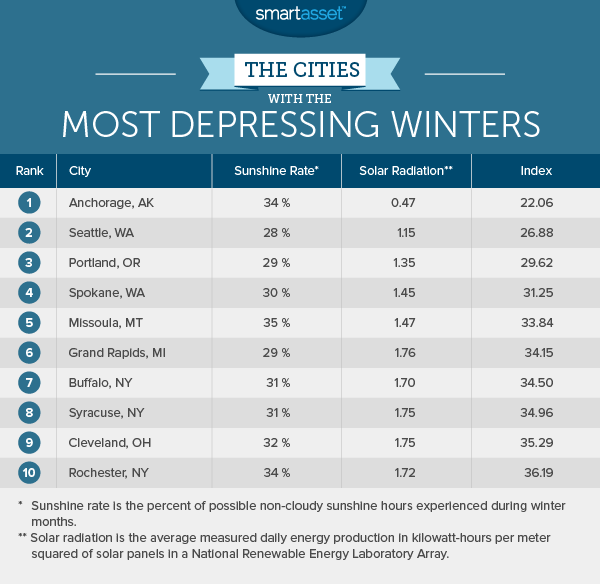 Five of the ten cities with the most depressing winters are located downwind from one of the Great Lakes. Lake-effect cloud cover makes winter sunshine a rare sight in these places. The sunny three: Arizona, Florida and Hawaii. 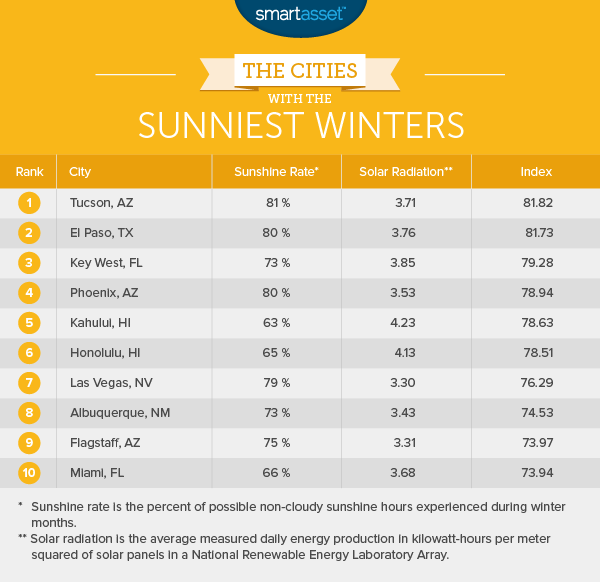 These three states account for seven of the ten cities with the sunniest winters. If you’re feeling the effects of S.A.D., you might want to spend a week in one of these three places. Anchorage in the winter is a dark proposition. Days in late December and early January last for fewer than six hours, day length doesn’t reach eight hours until February. Even when the sun is out, you may not be able to see it: Anchorage receives just 34% of the possible direct sunlight in the months of November, December, January and February. On the other hand, just because it’s night time doesn’t mean there’s no light in the sky. On some magical winter nights, the skies above Anchorage are lit up by the Aurora Borealis, or the Northern Lights. Many Anchorageites will also tell you that their beautiful summers, when it’s nearly always day time, more than compensate for their difficult winters. Despite its reputation as one of the rainiest cities in the country, Seattle doesn’t actually receive that much precipitation. In fact, the Emerald City receives less precipitation each year than New York City, Washington, D.C., Houston and Atlanta—Seattle’s 38.6 inches of precipitation annually doesn’t even crack the top ten for major U.S. cities. No, what sets Seattle apart (meteorologically at least) is the darkness. It is the northernmost major city in the contiguous U.S., which means that in the winter the sun rises later and sets earlier. Even when the sun is up, it’s probably behind clouds: according to the NOAA, Seattle has clear skies just 28% of the time from November to February, the lowest rate of any city in the U.S.
Of course, for the most part Seattleites learn to embrace and even enjoy the darkness. It’s a part of the culture in the city that gave the rest of the world grunge music, pumpkin-spice lattes and 1-click online shopping. These are all welcome diversions in a city where the sun rarely shows its face for a third of the year. Located three hours south of Seattle, Portland suffers through the same dark northwest winters, but to a slightly lesser degree. While Seattle gets just 28% of its possible sunshine, Portland is sunny 29% of the time in the winter. Likewise, the average panel in a NREL solar installation generates 1.35 kilowatt hours per meter squared every day during Portland’s winter months, as compared with 1.15 in Seattle. Word of advice to new Portlanders: to escape the gloom, head east. Many cities east of the Cascade crest receive upwards of 200 days of sunshine every year! The fourth city in a northwest quadrumvirate of gloominess, Spokane is actually slightly further north than Seattle—its shortest day is a full 23 seconds shorter than Seattle’s. The good news for Spokanites is that their weather isn’t quite as gloomy as either Seattle’s or Portland’s. On average during the months of November, December, January and February, Spokane is cloudy 70% of the time. Home to the University of Montana, Missoula sits on the Clark Fork River in western Montana. In general, winter temperatures in Missoula are in the 10s and 20s, however the occasional arctic blast can send the mercury plummeting. The coldest temperature ever recorded in Missoula is negative 33 degrees, in January 1957. While Missoula’s winters may be dreary, residents make up for it by staying active; Missoula is one of the most fitness-friendly cities in America. Grand Rapids owes its high placement on this list to the proximity of Lake Michigan, which lies about 30 miles to the west. Lake-effect clouds keep the Furniture City gray during the winter, contributing to its measly 29% sunshine rate from November to February. That’s the second-lowest rate of any city in our study, tied with Portland, Oregon. The gloomiest winters on the East Coast are in Buffalo. Like Grand Rapids, Buffalo suffers from lake-effect cloud cover and lake-effect snow off of a Great Lake—in this case, Lake Erie. Occasionally winds off of Lake Erie can dump several feet of snow on Buffalo over the course of just days, as happened most recently in November 2014. With nearly 150,000 residents, Syracuse is the fifth-largest city in the state of New York. Like Buffalo, it lands in the lake-effect snow cross hairs, which contributes to its 31% winter sunshine rate. Behind Grand Rapids, Cleveland is the second cloudiest city in the Midwest. Cleveland averages about 3.5 days a year when temperatures dip below zero. Like Buffalo and Syracuse, it sometimes gets caught in Lake Erie’s shadow, leading to extra could cover and snow. Rochester is the third-most populous city in the state of New York, and the home of the Eastman Kodak Company. The city actually sits between Buffalo and Syracuse, but because of it is at a more northern latitude than either, it receives slightly less lake-effect cloud cover during the winter. At the edge of the 110,000 square mile Sonoran desert, Tucson receives just 11.8 inches of precipitation a year. It has the sunniest winters of any U.S. city, experiencing cloud cover just 19% of the time. In fact, a study by researchers at the University of Arizona found that the area’s residents suffered skin cancer at rates at least three times higher than in northern cities. Skin disease is less of a threat in the winter, when the sun’s rays are less powerful, but even so remember to protect your skin if you’re going outside in this sunny city! Every winter, El Paso plays host to college football’s “Sun Bowl,” the second oldest bowl game in the country. (Fittingly, the most recent victors were the Arizona State Sun Devils.) As the game’s name indicates, El Paso is one sunny place. It receives 80% of its possible winter sunshine, the second highest rate in the country. The southernmost city in the continental U.S., Key West sits about 100 miles off the shore of Florida, in the Gulf of Mexico. It is a popular destination for Americans seeking winter sunshine, and its beaches and Caribbean waters make the deal that much sweeter. If you’re suffering from Seasonal Affective Disorder, the best move might be taking some time in Key West. Phoenix is one of the fastest-growing cities in the country, with the metro area’s population expected to surpass 6 million by 2030. At least a part of that is a result of the pleasant, sunny winters. The low temperature in Phoenix in December and January rarely dips below 40, and the high is generally in the upper 60s. The biggest city on Hawaii’s second-largest island, Kahului serves as the launching point for all Maui-based adventures. It has the island’s main airport and its best shopping. It also has some of the sunniest winters of any city in the U.S. Sitting at 20.88 degrees north, it receives as much solar radiation in the winter as Anchorage, Alaska does in the summer. Dreaming of Honolulu? We are too. Hawaii’s largest city doesn’t really have a winter—even in January, the average high is 80.1 degrees, and the sea temperature in the waters off of Honolulu’s coast is a comfortable 77 degrees throughout the winter. Try not think about that the next time you’re bundling up for a trip to the grocery store. If you’re going to Vegas in the wintertime, there’s one safe bet: sunshine. Sin City is sunny 79% of the time in the months of November, December, January and February—the fourth highest sunshine rate of any city in our study. Albuquerque lies at the north end of the 140,000 square foot Chihuahuan Desert, and enjoys an average of 278 sunny days a year. Thanks to its elevation (which ranges from 5,000 to 6,700 feet), Albuquerque receives occasional snow in the wintertime, but in general the winter weather is mild and dry. Visitors to Albuquerque should take a ride on the Sandia Peak Tramway, the longest aerial tram in North America. Unlike most of the other cities on this list, winters in Flagstaff can be cold, and large snowstorms are not unusual. Between those storms, however, Flagstaff experiences abundant sunshine. At 7,000 feet above sea level, Flagstaff is also among the highest cities in the U.S., which means the sunshine it receives is that much stronger. Even in the winter, sunglasses are recommended! Though Miami’s weather varies little from season to season, it experiences a dry season from November to April (when the rest of the country is suffering through “winter”). That means there’s plenty of sunshine to be had on Miami’s legendary beaches, where the most-dedicated beach bums remain until the break of dawn (to paraphrase Will Smith). To find the cities with the darkest (and brightest) winters, we looked at data on two different metrics of winter weather and sunlight. First, we used data from the National Oceanic and Atmospheric Administration on the percent of possible sunshine in the months of November, December, January and February for each area. So, for example, a city with a 50% sunshine ratio would have clear skies about half the time; a city with a 75% sunshine ratio would have clear skies three quarters of the time, and so on. Since that metric does not account for differing day lengths between latitudes, we also considered the amount of solar radiation hitting each city in the darkest months of the year. We looked at 30 years of solar panel data collected at solar arrays around the country by the National Renewable Energy Laboratory, and calculated the average daily energy production in kilowatt hours per square meter of a solar panel in each city during November, December, January and February. Each array has multiple types of panels which face in multiple directions. Some panels are angled toward the southern sky, which is ideal for the northern hemisphere. Some panels track the movement of the sun. We took the average of all 12 panel types in NREL arrays, to capture the “ambient sunlight” in each location. The average production of a panel in an array located in Fairbanks, Alaska produces just 1/10th of a kilowatt hour per square meter each day during the month of December, while a panel in Phoenix produces an average of 8.4 kilowatt hours per square meter (kWh/m2) during the month of June. Those are the lowest and highest possible values for a U.S. city. Based on the above two metrics, we applied a score from 0 to 100 for every city in our study. A city that was sunny 0% of the time during the winter, and which received absolutely no solar radiation would receive a 0 in our index. On the other hand, a city that was never cloudy and which received continuous direct sunlight would receive a 100. If you have your sights set on moving to a sunnier place, it’s a good idea to understand how the change will impact your budget. SmartAsset’s paycheck calculator can help you determine how living in your new home will impact your take-home pay. A financial advisor can help you navigate big life changes like a move, or just with identifying and meeting your financial goals in general. If you’re planning a move, consider talking to a financial planner to see how the change will impact your financial life.